Why OMSB planted? I started planting a variety of saltbushes in 1989, but since 1993 have been planting mainly omsb. The reason was to get more production from saltland and to increase the total number of sheep on the property. What grazing and pasture benefits have been observed? Stocking rate on the saltland with omsb has increased up to 4 times that of unimproved saltland, and is up to double the rate on the arable (annual pasture) areas of the property. In a drought, the sheep have put on weight and maintained condition on omsb. Trials with the Animal Production from Saline Lands Systems (APSLS) programme show that omsb is a good fodder. Wool quality appears to be improved. I like to include dry material, such as grass or hay, with the omsb. What financial benefits have been observed? Sheep can be grazed on omsb during autumn to replace supplementary feeding. In times of drought, it equates to a saving of up to $1 per head per week. Feedlotting on omsb at the beginning of winter and deferred grazing on annual pastures enables more sheep to run on the property. Biggest OMSB impact? Reduced salinity, lower watertables, increased annual grasses and clovers, increased stock numbers, greater income. Watertable measurements show that omsb lowers watertables at least 1 metre. Following recent heavy rain (85mm), the watertable rose 6cm under omsb and 137cm on annual pasture country. More birds and ground animals now inhabit the area of omsb. Even kangaroos seem to like it! Any problems with OMSB? Mustering! It is sometimes difficult to get a clean muster, and a motorbike is essential. Clean fresh water must be piped into the saline areas. All my omsb is direct seeded (not seedlings) and soil is sand over clay shallow duplex. Deeper sands and very heavy clays are difficult with this method of establishment. Do you / if you had a salinity problem, do you think OMSB would help with controlling deep drainage and/or lowering the water table? I have seen definite benefits in salinity control and watertable drawdown with omsb. Watertable measurements had proved this. Would you like to increase your area sown to OMSB? At the moment I am planning to increase the area to the limit of my saltland. Some of the earlier plantings of other varieties will be now planted to omsb. The next stage is to plant arable areas which are at risk from rising watertables and waterlogging to omsb in alley style plantings so that crops can be grown in between the rows of saltbush. What limits your planting of a larger area? Only the limit of suitable land on the property. 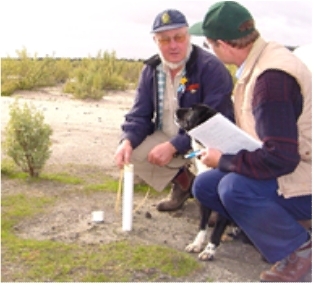 Michael has been leading Western Australia with his work on saltland reclamation by using saltbush. He has had good success from the use of saltbush seed.